My Week in Art: Australian Artist - second prize! 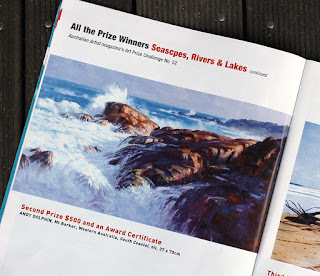 I was very pleased to read the news that I'd taken out second prize in Australian Artist Magazine's "Seascapes, Rivers & Lakes" Art Prize Challenge No. 52, with my entry "South Coastal". My painting depicts a location near Denmark, on the south coast of Western Australia. I told the story of it back in February, this year, as part of my Evolution of a Seascape series of articles. While the location is real and the painting is true to the place, there were quite a lot of design decisions employed to make it something more than "just like a photo". Winners and finalists are featured in the June, 2013 edition of Australian Artist Magazine. Congratulations to first-place getter Jayne Henderson from Victoria, third-place getter Craig Addley from Queenlsand and to all the finalists. I have to admit when i first saw this painting i found this work menacing/playful because of the way the internal dynamic of the Egyptian motifs seems very disturbing in light of the remarkable handling of ljght.